Millis, MA- Local Author, Arlene Lagos has recently launched, “Sneaky Pete”, a middle-grade fiction novel which is also the second children’s book in the circle series. Lagos will be holding an upcoming book signing during the Annual Bayberry Craft Fair on Saturday, December 5th from 9am-4pm at the St. Thomas Large Hall 974 Main Street in Millis, MA. 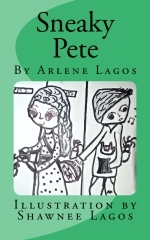 Sneaky Pete: Emma’s cousin Pete comes to live with her family. Emma is excited but Pete is not. When Pete starts sneaking around and getting into trouble, Emma is forced to cover up for him. When Pete finds himself in real danger, will Emma find the courage to speak up and save her cousin? Lagos, a native of Massachusetts has written several books including the Science-Fiction Fantasy Trilogy, “Beyond Earth Series”, a middle-grade fiction novel, “Outside the Circle”, and the first two books in the Butterflies Series, “Butterflies Wake” and “Butterflies Rising”. Lagos also has recently launched, “Thought Garden” a collection of short stories and poems that are now available. Her goal in life is to create and to inspire the world around her. Lagos currently resides in Millis, Massachusetts with her husband and their daughter. This entry was posted in Authors To Read, Books and tagged adventure, Amazon, author, Books, boys, chapter books, Children's, Courage, danger, death, Female, fiction, Friendship, Girls, grief, juvenile fiction, Middle Grade, new home, new release, novel, stranger danger, tattletale, Writer, Writing. Bookmark the permalink.